INNOVATOR, TECHNICAL AVATAR, eternal seeker—all of these terms apply to the extraordinary John McLaughlin, who helped pioneer jazz-rock in the early '70s with the high- energy Mahavishnu Orchestra. But what best describes the 43-year- old Englander is the less romantic label musician. While many guitarists seem trapped in a harmonically bleak, pentatonic prison, McLaughlin's depth enables him to freely explore the musical landscape, visiting points that have ranged from Mahavishnu to Indian-based Shakti to acoustic fusion with Paco de Lucia and Al Di Meola. Few musicians, let alone guitarists, a resume rich with so many artistic triumphs. Since John appeared on the cover of Guitar Player in August 1978, he has continued to expand his creative boundaries. In 1983, he reconstituted the Mahavishnu Orchestra, taking up the landmark Synclavier synthesizer guitar. 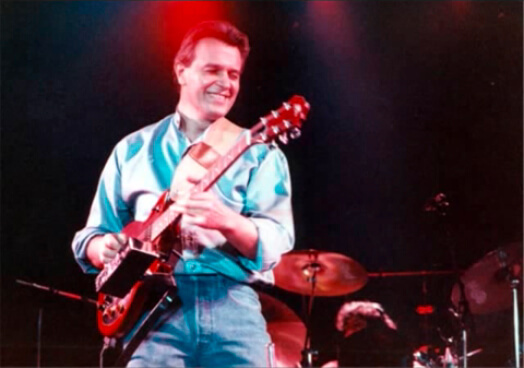 After recording Mahavishnu and touring extensively, he turned his attention to the classically oriented score for his Concerto For Guitar And Orchestra. Like many true artists, McLaughlin has failed to receive full credit in recent years. While a smattering of vitality exists, the contemporary jazz market seems to prefer the familiar to the creative. "In terms of commercial success," John explains, "all artists are suffering If you're not a pop or rock star, your music doesn't get propagated, but that doesn't mean I'm not excited about the future." 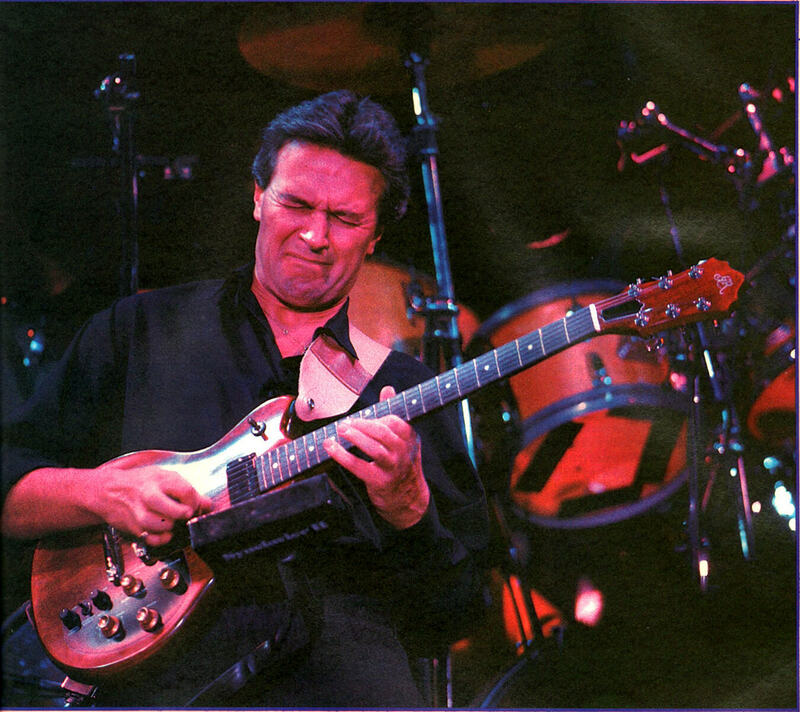 Guitarists in particular too often let McLaughlin's advanced technique and vast musical vocabulary obscure his work's intelligence, passion, and wit. But in spite of being sometimes misperceived and relatively unrewarded, he has continued to evolve artistically. While he is known for his early, relentless intensity, his later work is more mature with unprecedented subtlety. McLaughlin defies categorization. Rooted in jazz, he was influenced by Django Reinhardt, Tal Farlow, and Jim Hall, trumpeter Miles Davis, and saxophonist John Coltrane. At the same time, he was fascinated with classical composers from Beethoven to Bartok. Later, he became interested in Eastern philosophies and music, studying rhythmic theory and instrumental technique with several Indian masters. These factors, intermingled with elements of rock and blues, helped shape his resilient approach to improvisation and composition, leading him to record with musicians as diverse as Jimi Hendrix, Miles Davis, bassist Jack Bruce, and Indian violin virtuoso L. Shankar. 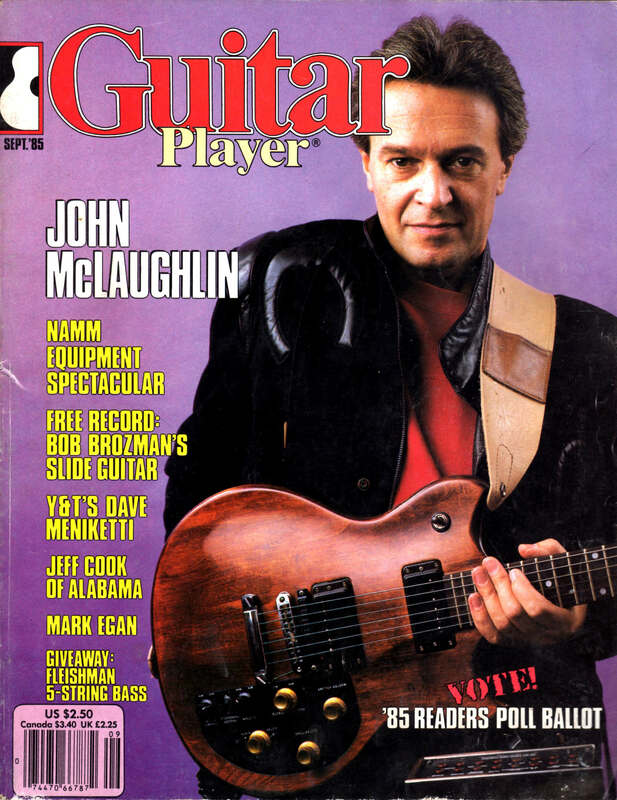 John was last featured in the March '81 issue of Guitar Player as a member of an acoustic trio with Al Di Meola and Paco de Lucia, shortly after they recorded their influential live album Friday Night In San Francisco. That same year, he shifted emphasis and recorded Belo Horizonte, which featured his acoustic guitar supported by a synthesizer-based ensemble. In early 1983, he picked up the electric guitar for Music Spoken Here; then he turned 180 degrees and again joined Al Di Meola and Paco de Lucia for the studio effort Passion, Grace & Fire. Unique custom instruments have often been necessary for John to realize his musical concepts. Through the years, he has played a number of guitars, including a Rex Bogue Double Rainbow double-neck and a series of drone-string-equipped instruments built by Gibson associate Abe Wechter, featuring scalloped fingerboards to facilitate microtonal bends. While he experimented with guitar synthesizers, he soon abandoned them, finding the technology too cumbersome and slow. A decade later, he is now using the sophisticated Synclavier system made by New England Digital (NED). For a controller, he employs a Roland G-303 guitar. (A description of the system is on page 85.) To showcase the Synclavier, in late 1983 John formed a new group, which recorded Mahavishnu in early '84. With keyboardist Mitch Forman, sax man Bill Evans, bassist Jonas Hellborg, and drummer Billy Cobham, the album features tight, multi-textural underpinning and blowing solos on eight McLaughlin compositions. Outstanding guitar performances include the bluesy, burning improvisation on "Nightriders" and the fluid, uptempo choruses on "East Side West Side" (John's first 24-bar solo is transcribed on page 87). More recently, he appeared on Miles Davis' latest album, You're Under Arrest. Although McLaughlin looks forward to 1986, when he'll use the Synclavier to record with the same personnel, he is currently concentrating on putting the finishing touches on his score for Concerto For Guitar And Orchestra, which he'll debut with the Los Angeles Philharmonic this November. Unlike his 1973 album Apocalypse, which featured the Mahavishnu group in conjunction with the London Symphony Orchestra, the concerto will have solo guitar only. Like Apocalypse, the piece is a collaboration with composer/ orchestrator Michael Gibbs. In the '70s, McLaughlin's progressive work was frequently referred to as ahead of its time. Now in the '80s, his endless experimentation and highly individual approach—oblivious to popular trends— suggests rather that he is in a different time altogether. Regardless of talent, many contemporary pop and jazz artists rarely do anything more creative than churn out one similar-sounding album after another. Meanwhile, John McLaughlin unendingly searches for new avenues of self-expression. Do Contemporary Pop and Jazz reflect the degree of creativity that they have in the past? On the whole, no. There seems to be a kind of hiatus going on. Today, rock and jazz are rhythmically, harmonically, and experimentally inferior to what was happening even as far back as the '60s. But this kind of backlash against intellectuality of any kind is more of a sociological problem than it is a musical one. It's cyclical, and a more receptive mood will return. However, you can't deny that a lot of pop music—including the type of easy-listening funk by so-called jazz musicians—is terribly banal. It's superficial, and it is not even covertly commercial; it's unashamedly blatant. Jazz is vital, living music that should be about life. Don't misunderstand me, because at the same time I don't knock any kind of music. I like Billy Idol, you know what I mean? There's room for everybody, and I like to think that if it's music, then it's good. It's the most profound spiritual power on earth. It sure beats the hell out of killing people. You have a reputation as a great technician. Can the intellectual and technical aspects of music get in the way of speaking from the heart? Not when the artist is wholly integrated in himself, which is something we're all working for. I'm alive. I have an intellect, a heart, and a physical side, and I want to integrate all three to be whole. In the process of evolution, you may emphasize one more than the other, but that is perfectly normal because you have to live life in order to integrate yourself. It's a lifelong work because it presupposes evolution as a human being. You are also known for exploring different musical areas. Does that result from curiosity and the urge to experiment, or is it due to frustration and restlessness? It's not due to frustration and restlessness. I get that from because my greatest competitor is my own inability and incapacity. It's from my love of music. If I hear something great, I want to know more about it. When I hear a great musician, I can feel his life and his elegance and his eloquence inside the music, and that makes me want to know more about him. Whether it comes from east, west, north, or south, music is my language. When I first heard some of the great Indian musicians, I had an enormous desire to know them better. To be able to play with them is satisfaction you cannot imagine, although I don't really play their way. I'm able to communicate with them because I know the rules governing their approach. Is communication generally improving between musicians of diverse backgrounds and cultures? The barriers amongst instrumental musicians don't exist like they did in the past, which is wonderful. We all need enriching, and if we are to make any kind of progress, we need inspiration. This is especially true in the exchange that's happening between jazz and classical players. There is a great deal of mutual respect, and both genres are looking for new blood. It's terrific that musicians such as (trumpeter) Wynton Marsalis, who plays both styles, is very much appreciated by classical and jazz audiences. [Pianists] Chick Corea and Keith Jarrett are very involved with classical music. On the classical side, you have musicians like violinist Gidon Kremer, who has recorded with Keith. Gidon has asked me to write a piece for him. [Cellist] Yo Yo Ma has also expressed interest. Of course, if it weren't for the encouragement of Ernest Fleischmann, who is the executive director of the Los Angeles Philharmonic, I don't think I would have taken on a project of such gigantic proportions as my concerto. How did you and Michael Gibbs come to collaborate on your concerto? I asked Michael because orchestration is an art that I don't pretend to be a master of. He is very gifted in that area, and the textural tableau from an orchestral point of view is so important. The challenge that I've had in writing the piece has been in establishing dramatic development and in evolving a structure that doesn't also use a small group. Although I'm taking the privilege of not being a "classical musician," I feel I have to observe classical music rules. My appetite is most surely whetted now, and I think I'm going to write another orchestral piece soon. Technically, is your concerto very challenging? How large a role does improvisation play? Improvisation is included because that's very important to me, but it's featured to a lesser degree. For that reason, I would be delighted if classical players would attempt it; the repertoire for classical guitar and orchestra is very small. There are sections of the concerto that are very difficult for me, but difficulty is hard to assess in terms of another player's technique. If a fingerstyle player does eventually attempt it, he'll have to be very flexible and open to adaptation. There are things you can do with a pick that are difficult to play with the fingers. Being a jazz musician, you develop the ability to modify your technique. But in many respects, fingerstyle technique is superior to pick technique. What instrument will you use? Will your Wechter have a scalloped fingerboard? No. That doesn't work with nylon strings because you have to pull too far to bend them; the density of nylon and steel is very different. With steel, you can do so much with so little. Can you envision yourself using the synthesizer guitar in a symphonic context? Yes, but I can only do one thing at a time. Right now, I am too involved with the concerto to think much about anything else. The Synclavier has a great deal of potential, but the next project I have in mind for it will be with my latest group, which I can see going on for a long time. On your last album—Mahavishnu—the Synclavier seemed to change the way you phrase. Did you feel that yourself? Your impression is very close to home. The Synclavier allows me to play in a way that is very difficult to do on a guitar. Conventional electric and acoustic guitars don't lend themselves to the horn-like flow of improvisation that's very dear to me. Guitarists - pianists, too, for that matter — play in a different way than do horn players. The work of Miles Davis, (saxophonist) John Coltrane, (saxophonist] Sonny Rollins, and [trumpeter] Clifford Brown made an indelible mark upon me, and I had to try to adapt my technique in order to accommodate the parameters that they use in their improvisation - I suffered because it was so difficult. I still suffer [laughs]. When I first began to experiment with the synthesizer guitar at the end of 1975, I realized that the potential as tremendous. The problem was that the technology was elephantine. The Synclavier helps break down the barriers that obstruct a guitarist from playing at his I owe a lot to the digital guitar. Players are continually adding strings and using alternate tunings to expand the guitar's possibilities. How close does the Synclavier come to being perfect instrument? It's a revolution. Although it requires that you modify our technique a certain amount, it's an instrument that allows you to enter the world of creative synthesis, which cannot be avoided. Of course, there are people will will never get involved with it. Fine. But for guitarists who are looking for new ways to create sound, it's tremendous. It's very exciting to be able to apply that musically. I've tried the other synthesizer guitars, and they're toys in comparison to the Synclavier. Do you feel the digital guitar eventually will replace more conventional instruments? For me, no. I fell in love with the acoustic guitar when I was 11, and for the rest of my life it will be my first love. But I feel that guitarists' involvement with synthesizers will be like what has happened to keyboard: First there was the acoustic piano, then the Rhodes crept in, and finally there were synthesizers. It's not a question of whether I have to make a choice. You can have your feet in both worlds, although I foresee in the not-too-distant future a real-time instrument. By that, I mean a synthesizer so sophisticated that it responds exactly like an acoustic guitar. Landmark acoustic fusion, featuring McLaughlin, Al Di Meola, and Paco de Lucia, 1981. Specifically, how does the digital guitar change your technique and approach to phrasing? Part of it depends on the kind of timbre (tone color) you're using. When you get involved in the creation of timbres with the synthesizer, you're creating a new world of sound. That's uncharted territory and something you can spend a lot of time doing. However, once you've got a particular timbre, its characteristics will directly influence you as soon as you start to play. It's as if you're suddenly playing another instrument. For example, if a timbre has a long sustain, you are able to articulate phrases that are impossible on a conventional guitar, so you must change your technique and your concept. If you have a given number of timbres, you have to approach them individually. Many timbres are impossible to play in a guitar type of way, and you almost have to caress the strings in order to coax the sound out. Can you describe how timbres are developed on the Synclavier? It's through what they call additive synthesis. You start at the screen of the computer terminal with sine waves, which are added together to make up the harmonic spectrum of a sound. Then you have what they call frequency modulation—FM synthesis which allows you to create complex timbres by modulating one set of oscillators with another. With additive, you use a volume envelope to control loudness of each harmonic over time, and you use a pitch envelope to varv the pitch of each harmonic over time. It's very pure and very simple. Once you've added these tones from the tone generator, then you start to work initial attack, initial decay, amplitude, and the decay of the volume and harmonic or pitch envelope. And that's just with one partial, a component of a given pitch. This sounds terribly technical, but it's fairly easy to do once you're there with the equipment. You can also take the factory sounds that come with the Synclavier and examine them on the screen and see what they're composed of. One of the main criticisms of synthesizer guitars is that they don't track accurately or quite fast enough for guitarists' taste. Perhaps players are asking too much and aren't willing to modify their technique. The nature of translating a guitar envelope—the characteristics of a sound—into digital information is very complex and sensitive. You have to be very precise because you're directing information, and if you miss something, the computer has a confused input and will act accordingly. Once you get used to the Synclavier, the tracking is phenomenal even with bends and dynamic nuances — but if you don't tell it what to do correctly, it'll fight you. As far as speed of tracking is concerned, if you compare it to the responsiveness of an acoustic guitar, which involves nanoseconds, then in some sense there's a very, very slight delay. But I've played quickly with the digital guitar, and if I'm playing right, it's there. Of course, guys at New England Digital are perfectionists and always see room for improvement. Did you have your Roland guitar modified in any way? No. I like to have guitars in my own way, but New England Digital preferred that I use the Roland stock so they could guarantee its performance, although that was some time ago. One of the main characteristics of synthesizer guitars in general is that they hate overtones and vibrations, which computers can read as additional but garbled information. For instance, the purpose of the crazy handle that joins the body and peg head on the Roland G-707 is to reduce certain resonances. Since then, I've talked to a Luthier I Mike Pedulla, who has cracked some of the problems concerning overtones in the synthesizer guitar body and in tracking. I'd like for him to build an instrument for me. Is the onboard control panel of your Roland guitar easy to use? It's very intelligently set up. Other systems use a series of foot pedals, but I like the freedom that the onboard panel allows. Of course, you can get used to just about anything. I don't see how the Synclavier system could be foot-activated because there are 16 buttons, each of which has two functions. At some point, I would like to have the control panel in the guitar itself, with the buttons flush to the body and the panel raised at 45 degrees, so you could see at a glance what kind of patch you're using. Onstage, what do you use for amplification? A Roland Jazz Chorus. I don't want have too much volume onstage; the less the better. At the same time, I don't want to have the rhythm section walk on eggshells because when the spirit gets them, they gotta testify. It's very reliable and it has some nice features, such as a distortion control. I use my Gibson Les Paul and Roland amp conjunction with a Scholz Rockman, which is a great invention. How many different timbres are Mahavishnu? About 30, but some of them are hard distinguish because they're mixed up with other sounds to create textures and to set up particular kinds of moods. In concert, I use about 25. Which cuts best demonstrate the digital guitar's capabilities? "Nostalgia" has a melancholy aspect that works well with the particular flute patch I used. The song has a classical Indian raga influence, where harmony is suggested by a drone. That timbre enabled me to play in a slow, melancholy manner, which can be difficult to evoke without being sugary. On "Clarendon Hills," there's a direct guitar in unison with the Synclavier. You can't really hear the direct guitar, but you can feel it. And "East Side West Side" has a funky kind of Wurlitzer organ sound on the opening. How did you avoid conflicts between the guitar and the keyboard? The minute a synthesizer guitarist starts playing with a synthesizer keyboardist, you become aware. Mitch Forman has done so much work on his timbres that they're his and nobody else's, so there's actually quite a bit of contrast. Why did you use the particular timbres on Mahavishnu? Part of the problem was that I went into the studio about six weeks after I got the digital guitar—when I record again later this year, you Il see a number of developments as far as sound is concerned. I went with timbres that I could identify with and felt comfortable with. Many players will think that the factory sounds are great and use just those because people are indolent—we all are. But I think it's very important to create the timbres yourself. The tendency to want to work less is just human nature. How can you suggest you're indolent, in light of your busy schedule and your dedication to the guitar? area that could use a little overhaul. Sometimes, if you get the right clue, you can unravel a great mystery. Many of my feelings about teaching and helping players have grown out of my relationship with a young friend been coaching, Yan Maresz, who is 18 and is currently attending the Berklee College of Music in Boston. What have you been helping him with? Primarily, I was fairly concerned with his theoretical background, which was very weak. He was a very good rock and roll player, but he was dissatisfied and wanted to make progress, so we started on jazz harmony and its application to the guitar. We also talked about classical harmony, although we stopped around the Impressionist period with Ravel, Debussy, Scriabin, and Satie. We haven't gotten to Stravinsky or Bartok. How did you approach jazz harmony theory? I began with chord structure, which is essential information for any occidental musician—oriental musicians don't approach music from a harmonic perspective. We took standards and looked for ways to extend the basic chords, using the rules governing chord extensions and related scales. In effect, we broke everything down into its scalar components and reassembled it using a scalar approach, which gives you a more linear view rather than a vertical one. And we thoroughly covered triads, which are such powerful units, especially when you begin to superimpose them in improvisation. Can you recommend some books about chords and scales? Vincent Persichetti’s 20th Century Harmony: Creative Aspects And Practice (W. W. Norton, New York) is a very important book. And I also highly recommend Nicolas Slonimsky’s Thesaurus Of Scales And Melodic Patterns (Charles Scribner & Sons, New York). Those two will take you a long way. What do you work on to improve your technique? It varies. The other day, I invented an interesting right-hand exercise that is extremely difficult. I took a highly convoluted melodic line—it can be any series of notes, really—with strange intervals and string changes. I practiced playing it at various tempos and rhythms. That kind of thing does wonders for your articulation, speed, and phrasing—the usual, boring stuff that's very important. What are the critical aspects of right-hand technique? It depends on your style. There are so many styles that work; it's so individual. For example, Allan Holdsworth, who has such an original style and plays very fast, relies primarily on his left hand. I articulate everything, picking almost all of the notes, which calls for strong discipline on the part of the right hand and necessitates a lot of fluidity in the wrist. It takes a lot of work to develop speed while staying relaxed. How do you stabilize your right hand? I rest the heel of my hand on the bridge, regardless of the type of instrument. From that anchor, my hand is resting and relaxed and I'm able to move my wrist with no problems. Again, what works for me might not work for someone else. You find your position through trial and error. Larry Coryell, for instance, plays with much more arm movement than I do. If you suffer from tension in the arm or shoulder, perhaps there's something wrong with the position of your hand. If your right hand is resting on the bridge, how do you move closer to the fingerboard? For very difficult passages, I can't play close to the fingerboard. However, for chordal accompaniment or playing that moves back and forth between linear and chordal elements, my hand floats in the air. Can you recommend some rudimentary right-hand exercises? I have developed a series that is tremendous for articulation and rhythm. Start with the first string and slowly play four quarter notes to the measure, all with down strokes. Then, while maintaining the same tempo - preferably keeping time with your foot, although you can use a metronome—subdivide the measure into six quarter-notes or two quarter-note triplets. Next, switch to alternate strokes and start progressing from eighths to triplets to sixteenths to sextuplets to thirty-seconds to forty-eighths to sixty-fourths. Finally, go back down again. This involves simple mathematics, but to execute it without losing tempo is quite a challenge for the right hand. Of course, you can approach it a little at a time. Now, that's just the beginning. Instead of progressing through multiples of two and three, you can work with odd-numbered figures, moving from one to two to three to four to five to six to seven and so on. If you were to play two triplets in a row, would the first one start with a down stroke and the second one start with an upstroke? Yes. You strictly alternate. When you get to five and seven, things become more unusual. The figure of five should be subdivided into a group of two followed by a group of three. It's very important that you accent each group, which is demanding from the standpoint of articulation because one group of five starts with a down stroke, while the next one starts with an up. A figure of seven is two groups of two followed by a three. This exercise forces you to be precise because you have to go from to figure without the flow. If your tempo is suspect, use a metronome. Otherwise just keep time with your foot. The next step in doing these exercises is to do them while changing strings. At some point, you'll be confronted with the necessity of changing strings on either an up stroke or a down stroke without losing tempo and articulation. In a round-about way, these exercises are related to the work I did with Indian rhythmical theory. That's a vocal discipline, isn't it? method with Shakti, and I will continue use it for the rest of my life because it's superior to any other approach. The greatest work that has gone on in rhythmic development has been by Indian percussionists. Shakir Hussain, the tabla player with Shakti, who also plays on "When Blue Turns Gold" (Mahavishnu), has an astonishing mastery of thythm. Do you ever find it frustrating to work with musicians who are unaware of these concepts? We each grow in our own way, you know. There are some people who don’t need them. Tony Williams, who is one of the great jazz drummers, or Billy Cobham or Danny Gottlieb, in his own way, don't need to study Indian musical theory. If it interests you, fine. I introduced Danny to this system, and he is really excited about it. Have you ever wished you had gotten into fingerstyle more? When I first picked up the guitar, I didn't know what a pick was. I still play fingerstyle bit, but there's room for improvement. As far as jazz is concerned, there is phrasing and articulation that is possible only with a pick. There are advantages and disadvantages to both styles, but after playing with Paco de Lucia, I'd have to say that flamenco technique is the most superior approach to the guitar. Many classical players will consider at to be a heretical statement, and I hope I'm not being myopic. Flamencos have an incredibly smooth five-note tremolo, while classical players use a four-note one. They also have an advanced thumb technique that allows them to play very quickly. Don't misunderstand me, because I think classical technique is phenomenal. I'm one of Julian Bream's greatest admirers, and John Williams is amazing, but Paco is absolutely inspired. How did you come to play on Miles Davis' latest album? Bill Evans told him that I was in New York, so he invited me to a recording session. Once I got there, he started some things up and told me to play. With Miles, you never know what's going to happen, so there's always an edge of nervousness. That's the way he pulls things out of you. Miles is playing great right now. Why does he have such a great affinity for guitarists? Because it's a little wild, I think. He doesn't like "cool" playing. His current guitarist, John Scofield, is one of my favorites. He's another one who's inspired. Speaking of inspiration, how do you place yourself in the kind of mood that enables you play at your best? I've been involved in yoga and meditation and everything like that — I still am. But a state of receptivity is nothing more than a state of awareness. I want the music to come from the deepest possible point in me so that I speak from my soul. It's a magical dream when that happens. When you're inspired, you can do anything.